I’ve started stripping this room in preparation for making a new bathroom. I pulled out every single nail I could find and used a powerful magnet to collect them all on a wonderful little nail-ball. Harcore recycling going on, but also to prevent kids and animals to step on them when I put the planks outside. I also did it to make it safe for my kids to “help” me. I want them to take as much part as possible, but a teardown involves many small dangers for tiny people. On this project my two sons age four and five helped tear down panels and cupboards, beating the crap out of everything I pointed to. Great fun! 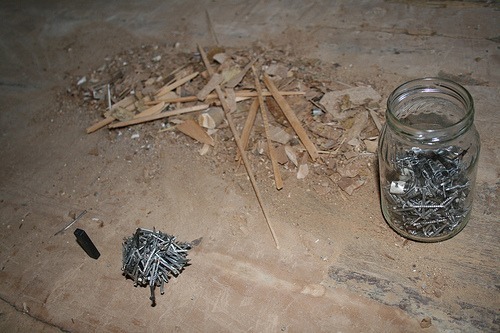 And after removing all the nails my oldest son Noah helped me throw it all out the windows. Linklove: This photo was favorited by the National Wildlife Foundation on Flickr.